Discussion in 'General flash photography, lighting, and technique' started by Uncle Frank, Sep 24, 2008. If I had the choice, I'd have two assistants following me around at receptions... one at camera left holding a big softbox, and the other at camera right with a big reflector. But for folks like me who have to do their own lighting, the Lumiquest is a practical solution for off-camera flash work at busy events. I hold a speedlight in my extended left hand, and shoot the camera with my right hand. It takes some practice, but imho it's worth it. The the results are far better than I was able to achieve with a flash bracket. Here's an example, photo courtesy of our forum mate, Kemnik. The softbox I'm using is 5x7", and looks like this. Now Lumiquest is introducing a larger version, and Dave Hobby, the Strobist, is working with them to demonstrate it. Here's the skinny from the Strobist. Thanks for showing this . I first got one many years ago, and also had the pocket bouncer and a few others. They do work very well , and are lightweight. I used it with a stroboframe flash bracket to keep it above the camera. I can't work the camera with one hand , so a assistant would be nice for doing off camera flash . I have the 5x7 and I get mixed results... guess I'm not sure how to use it yet. The strobist says it should be pretty close to the subject? Would that spread out the light more? No, but it would make the light source larger in relation to the subject, which is what actually "softens" light. The following article might help with the concept. 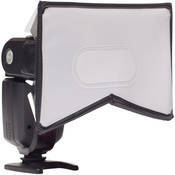 I'm going to be an early adopter of this BigAzz Lumiquest softbox. I've placed an order with Adorama. They have the best price - $36 with free shipping - but no inventory yet. It shouldn't be a problem, as Lumiquest is filling the pipeline very quickly. One of my local stores received their allocation early this week... but they're charging $45, which means nearly $50 after tax. I can wait on Adorama. Here's their link. I'm going to use it outdoors, when I put the remote on a lightstand. Since it's relatively small, it shouldn't catch the wind and turn into a sail. Is there a picture of this thing...for scale? I'm still a metric girl...need to see this visually. It's 8 inches by 9 inches, Linda. Cut 2 inches off the top of a piece of computer paper, and it will be roughly that size. I'll post a picture of the actual softbox as soon as I receive it. Sounds cool!! Then after you are done with it, you can sleep in it as a tent. I'll probably get one too (for the camera not a tent). This place is sooooooooooo bad for my wallet. I just ordered one too. thanks Frank. Are we playing the blame game? +1 for Frank - just ordered one of these too, not sure how the hand holding will work but I'm game! Linda - you have to take some blame too - your post (https://www.nikoncafe.com/vforums/sho...d.php?t=185190) made me buy a 50x50 Westcott giant umbrella softbox. And now I'm looking at one also!!! The Lens Lust forum should have a sign on it: Enter at own risk.